Texas Gov. Greg Abbott is joining a growing number of state lawmakers wanting to make attacks against police officers a hate crime. Abbott said Monday he will ask the Texas Legislature to pass the "Police Protection Act" next year that adds police officers to the list of protected classes under the state's hate crime law. His announcement follows the recent fatal shootings of five officers in Dallas and three others in Louisiana. Texas "will no longer tolerate disrespect for those who serve," Abbott said. Louisiana became the first state in May to extend hate crime protections to police. Lawmakers in Massachusetts, Kentucky, Wisconsin and other states have floated similar proposals. Abbott also wants to strengthen penalties for crimes against law enforcement officers even when the incident wouldn't qualify as a hate crime. For example, assault with injury would move up to at least a second-degree felony crime. 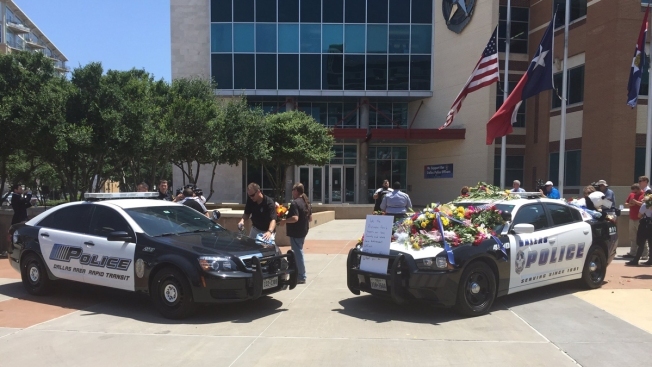 Many people visiting the memorial outside Dallas Police Headquarters on Monday afternoon said they support the idea. They said it's a way of creating a culture of respect and civility towards law enforcement, and it would help make police officers feel safer out on calls. But Dallas community activist Minister Dominique Alexander opposes the plan. He says there's enough state and federal laws protecting police, and the core problem is that violence against minority suspects goes unpunished. "There are already federal statutes in place that address the officer's safety and concerns," said the founder and president of the Next Generation Action Network. "It's another meaningless bill that does not address the entire situation between police and the community. The issue in America now is about us coming together on both sides of the fence, and addressing these issues between police and community." "We must continue to come together in the city of Dallas to address the issue of police brutality in our community," Alexander said. "Why do officers get up to 72 hours after a shooting to make a statement? Why is there no accountability for police brutality?" He referred to the Police Protection Act as a "reactive and meaningless bill." The Next Generation Action Network announced it is holding another protest and march through downtown Dallas on Thursday at 6:30 p.m., two weeks after the deadly ambush and murder of five Dallas officers. The protest will begin at the Main Street Gardens. The July 7 protest and march through downtown had been peaceful and without incident, and investigators believe the lone gunman in that attack was unaffiliated with the protest march, and that he used the occasion as his opportunity to murder police officers who he knew would be on scene. "We condemn any violence. We condemn all violence. On both sides," Alexander said. "But we must continue to come together in the city of Dallas to address the issue of police brutality in our community."